If you manage database systems for large web applications, your job can be quite challenging. When unforeseen situations arise, making configuration changes can be complex and risky due to the stateful nature of those database systems. And before launching a new application, you have to do a lot of capacity planning, such as the number of virtual machines (VMs), the amount of disk storage, and the optimal network configuration, while contending with unknown factors such as the volume and frequency of open database connections and evolving usage patterns. You also need to do regular maintenance work to upgrade database software and scale resources to meet growing demand. All of this planning and maintenance takes time, money, and attention away from developing new application features, so it is important to find a balance between provisioning enough resources to handle heavy loads and overspending on unused resources. Cloud Datastore can help minimize these challenges by providing a scalable, highly available, high-performance, and fully-managed NoSQL database system. We recently published an article that presents an overview of how to build large web applications with Cloud Datastore. 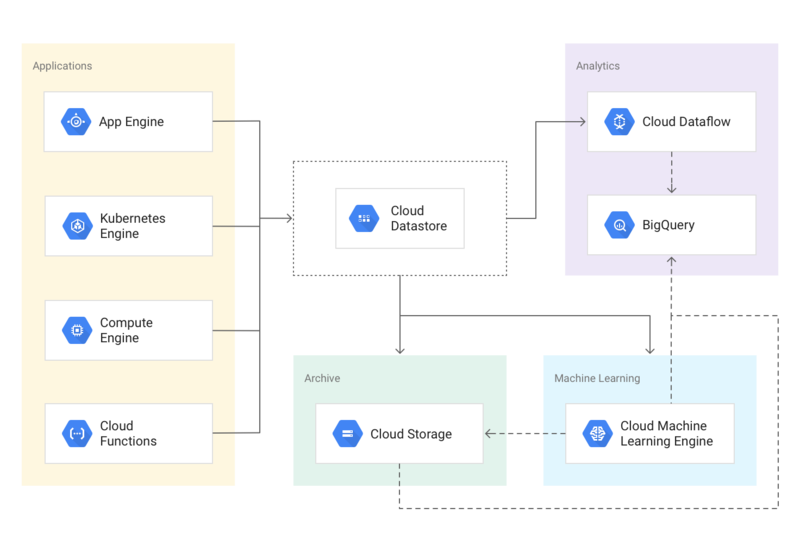 The article includes scenarios of full-fledged web applications that use Cloud Datastore jointly with other products in the Google Cloud Platform (GCP) ecosystem. Check out the article for all the details and next steps for building your own scalable solutions using Cloud Datastore!